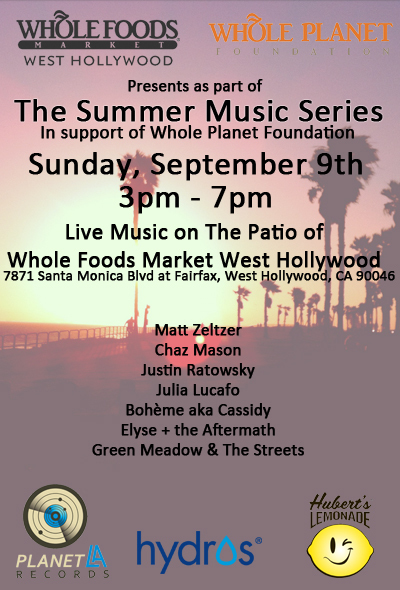 Join us for the finale of the Summer Music Series at Whole Foods West Hollywood (7871 Santa Monica Blvd & Fairfax Ave) on Sun Sept 9th from 3-7pm! Artists and bands performing on the patio include Matt Zeltzer, Chaz Mason, Justin Ratowsky, Julia Lucafo, Bohème aka Cassidy, Elyse + the Aftermath and Green Meadow & The Streets. Sponsored by Hubert’s Lemonade and Hydros Bottle in support of the Whole Planet Foundation. Free show, all ages. Free lemonade and food specials!